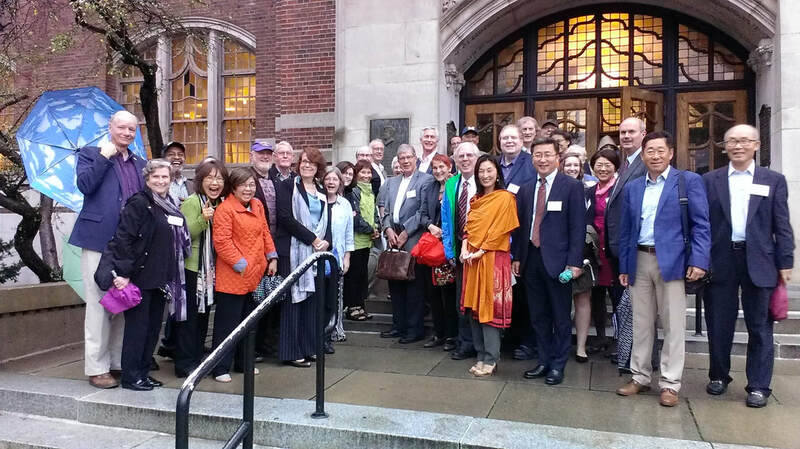 A photo of the attendees at this year's annual meeting in Ann Arbor on the occasion of the 57th anniversary of JFK's speech on the steps of the Michigan Union in which he asked who was willing to give up two years of their life to go overseas.. To see more photos, click here. Margaret Condon Taylor shared some her photos taken as a volunteer back in the late 1960s and encouraged us all to look in our closets and get those containers of slides out and digitized! Michael Robinson, Professor Emeritus at Indiana University, gave a thought provoking talk called "Reflections on North-South-US Relations in the Trump Era." Nojin Kwak, Director of the Nam Center at UMICH, gave a short history and overview of the center and its many activities. The Nam Center was a recipient of the fourth annual 'Giving Back Initiative' in recognition of its extensive public programming in the community and dedication to encouraging social, political, cultural and economic understanding of Korea. The afternoon was capped off by an unscripted conversation with five of the O'Donnell honorees. This year, the FOK Board presented the second annual Kevin O'Donnell Distinguished Friend of Korea Award to an eminent group of fourteen scholars - all former Peace Corps Korea volunteers who, upon the completion of their service, pursued careers in Korea Studies and became leaders in the field. These scholars - Mike Robinson, David Nemeth, Laurel Kendall, Milan Hejtmanek, and Don Baker - shared their perspectives on the development of Korean studies and the changes in the field over time. To learn more about this year's award, click here. The day concluded with a wonderful dinner hosted by Consul General Jong-Kook Lee at a nearby Korean restaurant.